Given the commentary from Jerome Powell (US Fed Chair) overnight, specifically around the trajectory of interest rates in the US (lower for longer) but more importantly the ability (and willingness) of the Fed to use unconventional measures to support the economy, trade in the US after the press conference and more importantly to us, the weakness across our market today was a bit of a surprise. I still remember the day that Fed Chair Ben Bernanke detailed his ‘whatever it takes’ approach to US policy which included a massive expansion of the Central Bank balance sheet. Overnight, Jerome Powell essentially said a similar thing and while markets reacted positively,Mr Powell received around 2c on the dollar relative to Mr Bernanke who got multiples on his investment…A bit of ho-hum response to Powell. Asian markets were higher today in response to the Fed, Hong Kong up +1%, however the move was muted. 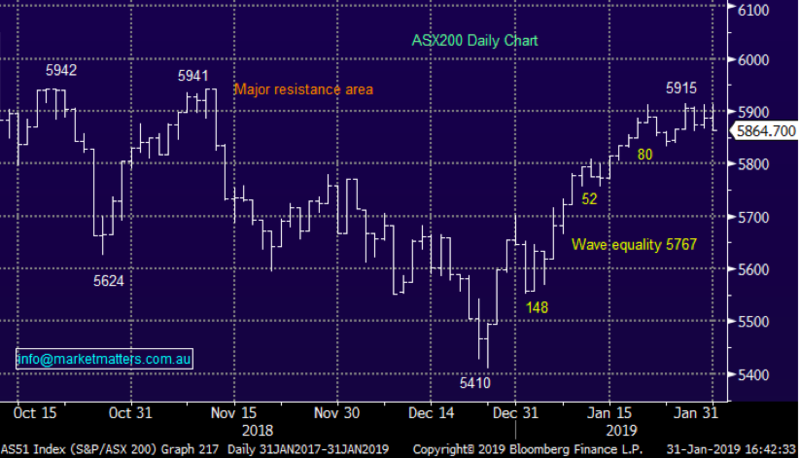 The ASX was weak, the index getting hit harder towards the end of the session as banks weighed – the majority closing on their lows ahead of the Royal Commission findings next week (Monday afternoon report is released). I had a discussion with an investor about that yesterday, and I suggested that it’s all ‘known knowns’ and surely the market has already factored this in? Seems not. CBA whacked 1.87%, ANZ -1.77%, NAB -1.61% & WBC hit hardest off -2.54%. China - Official PMI (manufacturing) data out todayand Caixan tomorrow.PMI better QoQ and Vs Street. Official manufacturing PMI was 49.5 in January, compared to consensus 49.3 and 49.4 in the prior month. However, still below 50 though = contraction.While better than expected, activity remained in contraction for the second straight month. 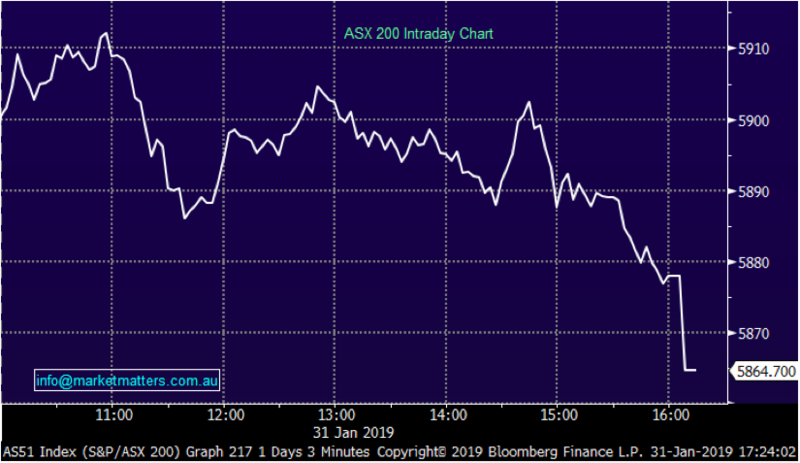 Overall today the ASX 200 closed down -22points or 0.37% to 5864. Dow Futures are currently trading up +3pts. Overnight Moves in Tech; Tech stocks were the strongest link in the US overnight thanks largely to a cracking result from Facebook and strong buying in Alibaba & Apple. I met with large US Investment Manager Alliance Bernstein today to talk about their outlook for US stocks. They manage $500b+ so have a fair handle on US equities. They love Facebook, are very keen on US tech for growth including Apple, Alibaba & Microsoft and are also large holders of Tencent. 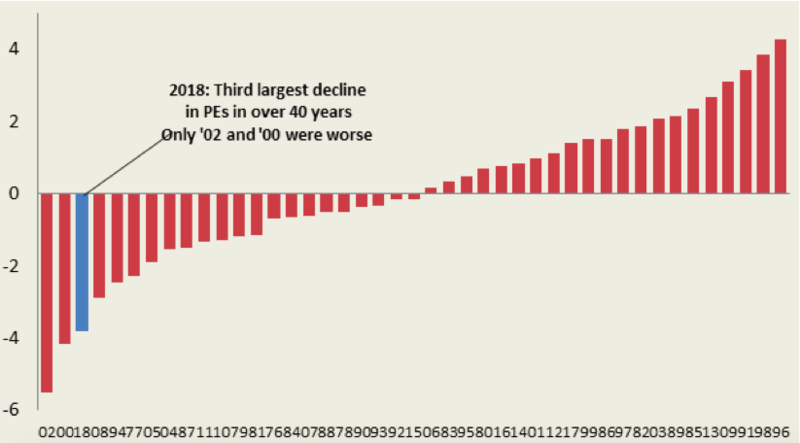 They showed a chart (below) which outlined the P/E re-rate we’re seeing in US stocks. Between 2014 and 2018 P/E’s expanded from 15 to 18 meaning that along with earnings growth, P/E expansion drove US stocks higher. We’ve now seen a big P/E re-rate (nearly -4 P/E points) happen on the back of falling earnings growth – they highlight (below) that it has actually been the third biggest re-rate, only behind 2000 & 2002. Overall, they don’t think US earnings will fall out of bed, and for that reason they’re investing as usual, mainly towards well priced growth. Just staying on tech, Xero (ASX:XRO) had a very good session today adding +8.77% to close at $43.43…while Appen (ASX:APX) traded up 1.66% to close at $15.95. We sold APX today from the Platinum Portfolio for a good profit. Big volume – Last day of the month;Big volume today through the market ~$10bn for the end of the month. For Jan we saw the index up +3.87% supported mostly by Energy and Tech, while the Financials where the only sector to end down. 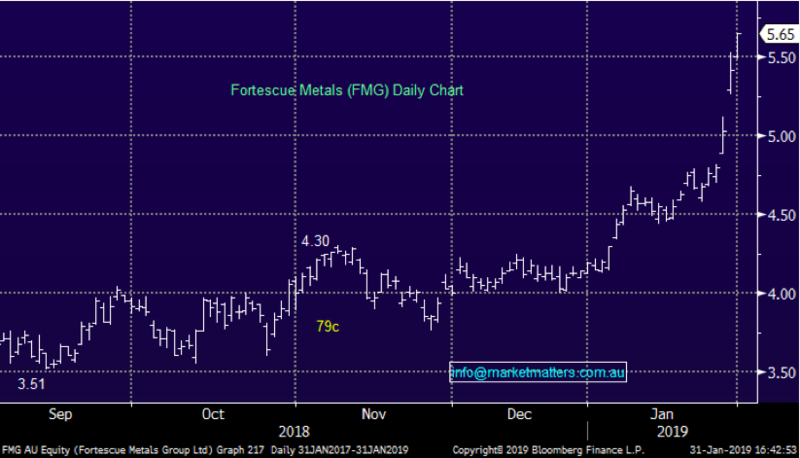 Foretscue Metals (ASX:FMG) +4.24% - another solid move in iron ore and a decent quarterly print for Fortescue helped the stock higher again today. Total ore shipped rose 5% on the same period in FY18, climbing to 42.5mt, while at the half way point for the year they have shipped a total of 82.7mt, well on track to meet the full year guidance. Costs also moved lower in the quarter, which is unsurprising given the maintenance undertaken in the first quarter. The key for Fortescue through the quarter was a reduction in the discount received on their 58% product, vs the global standard 62% price index. The discount blew out to 40% early in the quarter, but has since tightened to around 20% helping FMG print cash. Fortescue also begun shipping a higher grade ore in the quarter, which the company plans to build to around 25% of product out by 2020. Big run from the miner! Western Areas (ASX:WSA) +7.31% - a great session on the back of the Nickel price. As one punter wrote on BB today, WSA looks as hot as Sydney feels today! 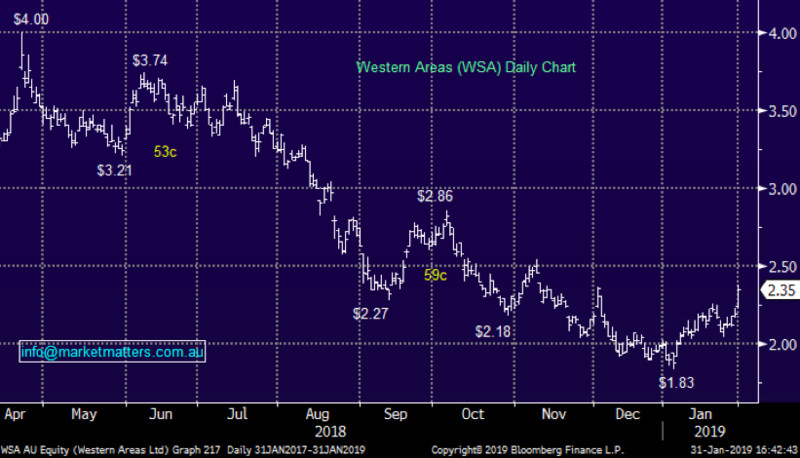 We remain bullish WSA with $2.50 looking likely in the near term. Want to learn more about Market Matters? Hit the 'contact' button to get in touch with us.